Through a generous $300,000 award from the Jack Kent Cooke Foundation, high school seniors enrolled in the foundation’s Young Scholars Program will be able to pursue areas of interest and advanced learning during a three-week residential program housed on the University of Connecticut’s Storrs campus in the summer of 2018. Modeled after the Neag School of Education’s Mentor Connection program — which was developed at the Renzulli Center for Creativity, Gifted Education, and Talent Development and hosted at UConn for 20 years — the Young Scholars Senior Summit (YSSS) program at UConn will be built on research evidence demonstrating the importance of mentors in high-end talent development. Student participants will be members of advanced-level research teams in self-selected areas of interest, led by faculty experts from across multiple disciplines. “We are so very thankful for the continued support and dedication from the Cooke Foundation for helping us to help impact high-potential students in need,” Renzulli adds. The Jack Kent Cooke Foundation Young Scholars Program is a national scholarship initiative for students in 8th through 12th grade who demonstrate exceptional academic abilities, unique talents, and persistence. Some of the students will be first-generation college students. The Cooke Foundation aims to prepare young scholars to get into and thrive at the nation’s best colleges and go on to fulfilling professional lives through which they make noteworthy contributions to the world in whatever they choose to do. The YSSS program will offer learning opportunities in areas not typically covered during the academic year. 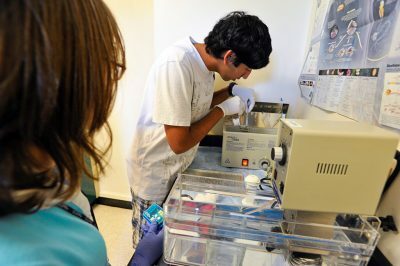 Instead of focusing on a classroom setting, the YSSS program will involve rising high school seniors from diverse backgrounds in current, relevant research activities in authentic situations in laboratories and other collegiate settings on the UConn Storrs campus under the guidance of University mentors. Accomplished UConn professors and/or advanced graduate students will host participants in their labs and studios and work with them on projects in shared areas of interest, emphasizing hands-on research and creative productivity. Check out past stories of support from the Jack Kent Cooke Foundation here and here. For more information about how to support Neag School programs like the Young Scholars Senior Summit program, contact Maria Martineau, associate director of development for University programs, at MMartineau@foundation.uconn.edu. The Jack Kent Cooke Foundation is a private foundation committed to advancing the education of high achieving students with financial need. The foundation supports exceptional students from elementary school to graduate school through scholarships, grants, direct service, and knowledge creation and dissemination. Since its founding in 2000, the foundation has provided over $175 million in scholarships to nearly 2,300 students from 8th grade through graduate school, along with comprehensive advising and support services. The foundation has also provided over $97 million in grants to organizations that serve such students.